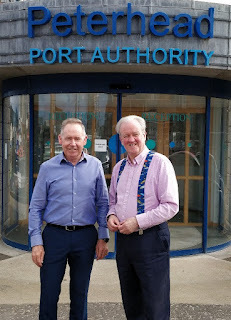 Local SNP MSP Stewart Stevenson met with newly-appointed Chief Executive of Peterhead Port Authority Simon Brebner. Mr Brebner took up his duties on 11 June having held senior positions in multiple ports throughout the world. With over thirty years commercial shipping experience he has a deep understanding of stakeholder needs and business activity. "Simon brings a wealth of experience in harbour management to Peterhead at a time when there is great change in our fishing industry. “He will be inheriting a harbour which has made a significant investment with its new fish market and I look forward to working with him to further the interests of Peterhead and the North-east”.